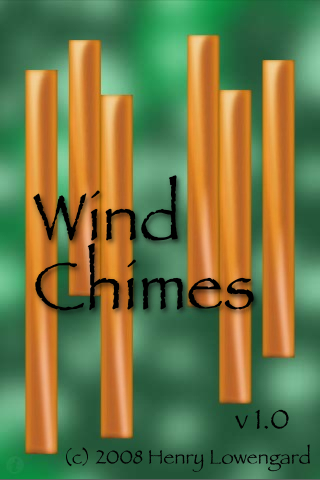 Look for Wind Chimes in the App store! Available now in the Music Section! "Set your being to chime time." The iPhone Wind Chimes app soothes with tinkling tones and visual vibes. Shake it, suspend it, or set it on automatic. Choose from several sounds, images, and backgrounds. Mix and match or use presets. No wind? No problem! By the author of the highly praised SrutiBox, Droneo, and LakePiano . This website serves as the instructions for the Wind Chimes application. Easy to start up. It awakens by playing each of the six tone bars in the default chime setting. Tilting the device in one of six directions will cause the associated tone bar to chime. The force with which it is tilted determines "force" with which it is struck. There is an automatic control so a motionless Wind Chime can still play (randomly, but at a settable rate from 0 to 100). Synthesized chime sounds which can be customized for attack, decay, timbre and chime tuning set. The barely visible info button reappears when you tap it. As with other iPhone/iPod touch sound apps, earbuds will greatly improve the sound quality. Especially on models with no speakers! Beware of loud volume levels! you can get some ugly distortion that way , and it's not nice on your speakers, earbuds or ears. Chimes are preset combinations of chime sound parameters and chime imagery. Tubes: Copper tubes on a mottled green background. Pure, sustained sound. Dots: Hanging translucent dots on an intense red background. Slightly richer, faster decaying sound. Spiders: Spiders on a blue background. High pitched, rapid sound. Surfboard: translucent Surfboards on a twilight sky. Bright, slowly decaying sound. Mobile: Abstract shapes on a textured orange background. Low pitched, fluty, slowly decaying sound. Flute: Blue tubes on a butterscotch background. High pitched fluty, slowly decaying sound. High: Spiders on a black background. High pitched, rapid sound. Tunings select compatible tones for each bar. These tones are transposed with the Pitch slider. Unity Close but not identical tones. Backgrounds select the background image for the chimes. Purple Sky: Twilight clouds, July 4, 2008. Orange Wall: Textured orange/red blend. Chime Images select images (and motions) corresponding to each "bar". Note that some of these are nothing at all like bars, and are not animated like them. Spider: A photo of a spider, which crawls up an invisible string. Mobile: Abstract Miro/Calder like shapes, moving in fast spirals. Blue Tube: Like the copper tube, but blue. Attack, which ranges from 0 to 10, controls the rate that the sound approaches its peak loudness. 0 is the fastest, 10 the slowest. Setting this to a higher number make for a less sudden chime sound, which is sometimes desirable. Decay, which ranges from 0 to 6, controls the rate that the sound decays from its peak loudness. 0 is the fastest, 6 the slowest. The settings near 0 make for some very nice short "raindrop" effects when paired with a fast attack setting. The length of the decay is considerable near the upper end of the scale. Pitch, which ranges from A2 to A5, controls the basic pitch of the chimes, which transposes the tunings available. It's good to find a suitable timbre to enhance the pitch quality, since the speakers in an iPhone are none too good, and not very loud at low frequencies. Headphones are also a good choice. Timbre, which ranges from 1 to 7, chooses between a related set of chime timbres, the simplest being 0, the most harmonically complex being 7. The more complex tones are more useful with low pitched chimes. Auto Rate, which ranges from 0 to 100, controls the rate that lets the Wind Chimes play themselves. 0 turns this feature off. Each control is accompanied by a sample of what that tone sounds like. Chime and Tuning selections play each chime bar. Also, how can I mention wind chimes without mentioning Woodstock Chimes? - world renowned makers of Wind Chimes and other instruments, based in nearby (to me anyway) Shokan, NY.